Another cold morning. As usual, it warmed up once the shadows passed our position as the sun rose. Part of my routine on the colder mornings, I made some tea (BIG thanks to my friend Maria who turned me on to this lovely non caffeinated beverage) and watched the light hit the valley. Despite the pending conclusion of our hiking time together, we were all still in pretty good spirits, enjoying the day, the scenery, and admittedly many thoughts of what we would do once we got to TOWN: pizza, beer, salad, showers, hot and cold running electricity to charge up our chargeables, oh the possibilities! Roads! We can see signs of Onion Valley Campground! A few miles from camp we left the JMT and hiked over Kearsarge Pass and down into Onion Valley where we planned to hitch into Independence CA and would likely meet Joe’s wife Terry and have access to a car for some re-supply action! But we had been hearing about some good “Trail Magic”. I also generally dislike “Trail Names”. I don’t understand the point and find them at minimum confusing, and often intentionally confrontational. Take my hiking partner Jake. We’ve been buds since 1996. He has been Jason or Jake to me since 1996. Now I gotta remember to call him “Floyd” to not confuse all the folks he is introducing himself to as “Floyd”. This would be the mildly inconvenient/confusing end of the scale. At the other end of the scale one finds names like “Überbitch”. UB is a very kind person. A former hiker spending her summer as a mobile support station for PCT hikers, she moves from spot to spot providing rides to and from town to trail as well as cold drinks (even BEER), food, and other random aid where needed. Why would you want to be called UB? When I asked her this she did not have some funny story about a thing that happened once and well it just stuck ha ha ha. No. She looks me right in the eye and says, “you haven’t seen me angry” and not in a spoofy Bruce Banner imitation kinda way either. She is serious, or thinks she is, and this puts me off in a very big way. I am not in the least frightened, but i do instantly think much less of someone who behaves in this fashion. This causes huge cognitive dissonance in my head because i like UB. She is nice. She is being nice to me at that exact moment, but the thing with choosing, using, and fully accepting such a name, and thrusting it at people – weird. Norma, from Day 17 and 18, hates her trail name. The name does come from a very memorable and amusing story, but she hates the name. So what does she do, she tells me HER FREAKING NAME and that is how i refer to her, Norma. …UB. She is parked and camped in Onion Valley with food, cold drinks, and is going up and down the mountain into town about once an hour. 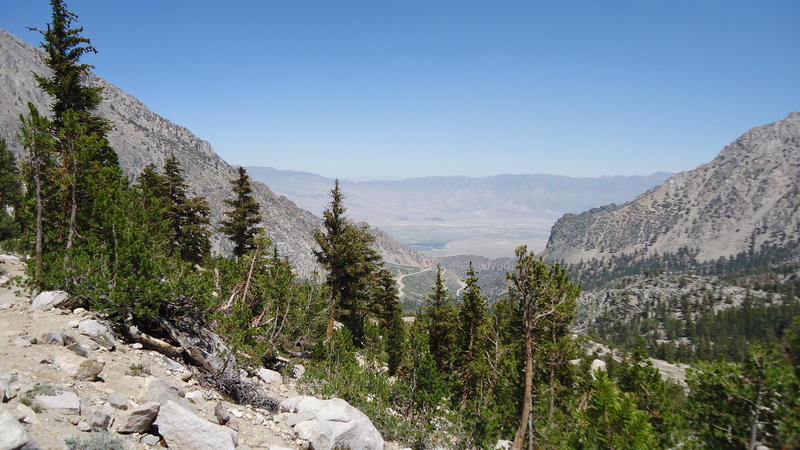 As we descended from Kearsarge, we got confirmation that she was still in Onion Valley and that was quite a boon to us. None of us are averse to hitchhiking especially in areas and at times known for hikers, like the area around Onion Valley and Independence. But it can be a long wait and not easy to find one ride for three stinky folks and their packs. 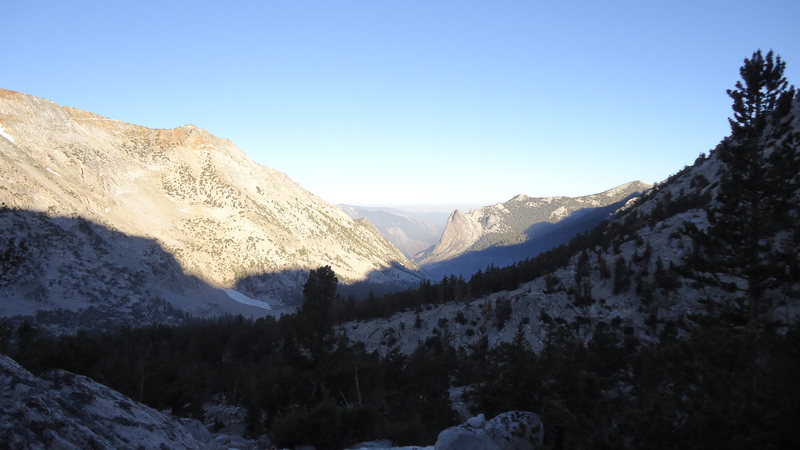 We are, obviously, not averse to a bit of a walk either, but do bear in mind: Kearsarge – 11,845 ft, Onion Valley – 5 miles away – 9,185 ft, the town of Independence – 13 miles from Onion Valley – 3,925 ft – it is a bit a walk down the hill to town from the trailhead at Onion Valley. Fox Force Four! Final Pass of 2012. We had lovely refreshment at UB’s camp and met many other hikers. Joe called Terry and she was on her way to meet us in Independence. We took the next shuttle down with UB and on the way she told me that Independence and the area surrounding it and the real life battles over water rights, that’s what the movie Chinatown is all about. I have seen Chinatown but when I watch it again it will be much more meaningful. This is one of the beautiful elements of travel – local knowledge. The difference between reading about a subject, a place, a people, and actually interacting with the people and visiting the location, getting to observe and participate in the lives of others cannot be over stated. Not to put down the book learnin’. If you can’t go “there” or meet “them”, definitely read about it. * This post is already a bit longer than my regular readers prefer, and i think i have had some after effects of discussing cognitive dissonance, so i am going to stop here and break the one entry per day format. The next entry will cover Town: the evening and the next morning, then we should be able to return to one entry per day for the remainder. Thanks Kelly! I don’t know what effect it might have on the pool of readers, but i intend to have a little more Nick in the entries in the future. I feel like i am getting the dust knocked off of my writing gears and am preparing to tackle some of the things i actually started this blog to write about.